In the Mediterranean diet, everything revolves around this essential ingredient because of its taste and nutritional aspects, but it is also a cultural matter. 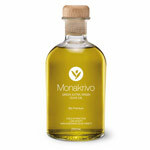 Olive oil—that is, extra virgin olive oil, because we are talking about the most widely touted member of the family—boasts unique nutritional characteristics. Because it is rich in vitamins and essential fats (the ones we cannot do without in our diet, as emphasized by the WHO’s latest guidelines) and because it is suited to all palates and dishes thanks to the immense number of varieties that are available. Italy produces huge quantities and, in fact, only two of its regions—Piedmont and Valle d’Aosta—do not grow olives. But this yellow gold flows freely everywhere else, from one end of the peninsula to the other, with different characteristics depending on where it is made. The oil can be fruity or not, and have more or less body, and range in acidity. Just like wine. To grasp all its facets, you should taste it without cooking it: in other words, just drizzle it right onto the dish you’re making or add it at the very end. This will maintain all its culinary qualities as well as its advantages in terms of wellness. Extra virgin olive oil is distinguished from plain virgin oil by specific sensory and chemical characteristics. According to EU regulations, olive oil can be defined as extra virgin only if it has a maximum acidity of no more than 0.8% (versus 2% for just virgin oil). Then variables in terms of taste and aroma are also considered. The perfect equation calls for a balance between the fruity components and the slightly piquant ones (caused by polyphenols). After that, it’s just a matter of preference and provenance, but there’s one thing to bear in mind: complete traceability. The label must clearly indicate not only that it is a superior-quality oil made only from olives and strictly with mechanical processes, but also that the origin of the olives is Italy. And not just that it was produced in Italy. Here are some of the best- known provenances.